An online Bachelor in Information Assurance and Security degree prepares graduates to land a rewarding job protecting a company’s most powerful asset: its information. A wide range of industries, including corporations, government agencies, and law enforcement, rely on the expertise of information security professionals. Individuals in this field ensure the integrity, confidentiality, and availability of information. They design, develop, implement, operate, and troubleshoot IT systems to safeguard a company’s information. Information assurance specialists manage the risks associated with information transmission, processing, and storage. With a Bachelor in Information Assurance and Security degree, students can meet the growing demand for skilled and well-qualified information assurance professionals. Through an online degree program, busy, working students can prepare to enter the field in a format that works with their demanding schedules. This article ranks the 17 best online Bachelor in Information Assurance degree programs available today. What is a Bachelor of Information Assurance and Security Degree? A Bachelor of Information Assurance and Security degree incorporates aspects of information systems and management to prepare students with the knowledge and skills necessary for a variety of information assurance careers. These programs develop familiarity with a variety of information technology concepts, as well as ethical and legal concerns of the field, management practices, and contemporary issues in the field. Typically, Bachelor in Information Assurance and Security degree programs cover such subjects as data protection, software security, hackers, Internet security, network security, network and computer forensics, security infrastructure design, e-commerce, and telecommunication systems. Some of these programs include internship or capstone experience components. Some of these programs also incorporate aspects of cybersecurity, developing niche skills in handling cybercrime and digital information threats. How Long Does it Take to Complete and Online Bachelor of Information Assurance and Security Degree? Like most bachelor’s degrees, an online Bachelor of Information Assurance and Security degree typically takes four years to complete. However, some schools offer accelerated programs that can be completed in as few as two years of study, while others offer part-time programs that allow students to earn their degree at a more relaxed pace. What is the difference between Information Assurance and Cyber Security? How much will I make with a Bachelor’s Degree in Information Assurance and Security? What kind of job can I get with an Bachelor’s Degree in Information Assurance and Security? Are there professional associations or organizations for those working in the field of Information Assurance and Security? We selected the programs based on the quality of the program, the types of courses offered, the faculty, rankings, awards, and reputation, including the school’s reputation for effectively providing online degree programs. Penn State World Campus ranks #1 on The Best Online Bachelor in Information Assurance & Security Programs! Penn State World Campus, the online division of Pennsylvania State University, offers a complete array of 100% online undergraduate, graduate, and professional degree and non-degree programs. Dedicated to meeting the unique needs of non-traditional students, Penn State World Campus includes plenty of internship and scholarship opportunities, and other valuable resources for students pursuing online education. Penn State World Campus offers an online Bachelor of Science in Security Risk and Analysis – Information and Cyber Security Option degree program for students seeking to enter the information assurance field. The comprehensive curriculum includes a range of in-depth courses, as well as hand-on experience through an internship. Students enhance their ability to anticipate and prevent cyber crime and information security incidents, implement and maintain network security strategies, and utilize contemporary tools and methods of information assurance. Students prepare to pursue a variety of careers in the field, including network security analyst, computer forensics specialist, and information security specialist. Students in the online Bachelor of Science in Security Risk and Analysis program must complete internship. The National Security Agency and the Department of Homeland Security designate Pennsylvania State University as a Center of Academic Excellence (CAE) in Information Assurance and Cyber Defense Education. Penn State World Campus is accredited by the Middle States Commission on Higher Education (MSCHE). 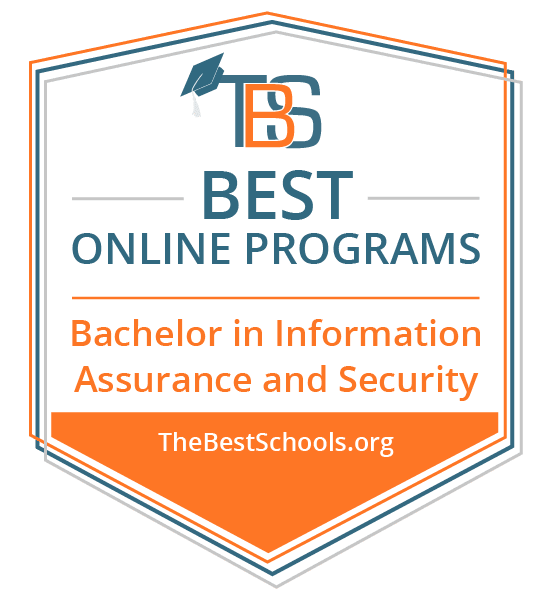 University of Illinois, Springfield ranks #2 on The Best Online Bachelor in Information Assurance & Security Programs! The Department of Computer Science at the University of Illinois, Springfield, provides a handful of undergraduate and graduate program options for students seeking to enter or advance in computer science professions. Housed in the College of Liberal Arts and Sciences, the Department of Computer Science serves traditional and non-traditional students through online program options, internship and scholarship opportunities, and other resources. The department also serves the community through high schools and other institutions as a Cicso Regional Networking Academy. The Department of Computer Science offers an online Bachelor in Information Systems Security degree program designed to prepare student for a variety of careers in the field. Through a blend of practical and theoretical approaches, the program ensures students develop key knowledge and skills. The curriculum includes in-depth coursework in areas such as programming language, network security and administration, and information risk management. Additionally, the curriculum includes an Engaged Citizen Common Experience component that situates information assurance professions in national and global contexts. Students prepare to pursue a variety of careers, such as network security analyst, security architect, and IT security specialist. Students in the online Bachelor in Information Systems Security program must complete a capstone project. The National Security Agency and the Department of Homeland Security designate the University of Illinois, Springfield as a Center of Academic Excellence (CAE) in Information Assurance Education. The University of Illinois, Springfield is accredited by the Higher Learning Commission (HLC). Kennesaw State University ranks #3 on The Best Online Bachelor in Information Assurance & Security Programs! The Department of Information Systems at Kennesaw State University offers several undergraduate and graduate program options in the information systems field. Housed in the Coles College of Business, the Department of Information Systems serves students through a variety of resources, including online program options, internship and scholarship opportunities, student organizations, and access to labs and centers, such as the Center for Information Security Education. The Department of Information Systems offers an online Bachelor of Business Administration in Information Security and Assurance degree program for students seeking to enter the information assurance field. The program develops key knowledge and skills necessary to information assurance professions. Students enhance their ability to manage information and cyber threats, utilize contemporary methods and tools, and develop and implement security strategies. The curriculum includes key topics, like network security, information security in a global context, and security programming. Students prepare to enter careers such as information security project manager, network security analyst, and cyber crime investigator, with career progress up to Chief Information Security Officer. The National Security Agency and the Department of Homeland Security designate Kennesaw State University as a Center of Academic Excellence (CAE) in Cyber Defense Education. Kennesaw State University is accredited by the Southern Association of Colleges and Schools Commission on Colleges (SACSCOC). The Michael J. Coles College of Business is accredited by the Association to Advance Collegiate Schools of Business (AACSB). Utica College ranks #4 on The Best Online Bachelor in Information Assurance & Security Programs! Utica College, a private sectarian college, enrolls over 4,000 students in a variety of undergraduate and graduate programs. Founded in 1946, Utica College builds its select variety of programs on over half a century of tradition. With internship and scholarship options, online programs, professional partnerships, and student organizations, Utica College serves career-focused students in several professional fields. Utica College offers an online Bachelor of Science in Cybersecurity degree completion program with a specialization in Information Assurance. The program meets the educational needs of individuals who have already completed an associate degree or equivalent and seek to finish their undergraduate education in this specialized field. The program utilizes a thorough curriculum to develop theoretical and practical knowledge and skills necessary to the field, with in-depth coursework and hands-on experience. The curriculum covers key aspects of information assurance professions, including risk management and system vulnerability assessment, developing and implementing network security plans, and digital forensics. Students prepare to combat cyber threats in a variety of professions, including network systems analyst, IT security specialist, and computer forensics investigator. Students in the online Bachelor of Science in Cybersecurity program must complete an internship or senior project. The National Security Agency and the Department of Homeland Security designate Utica College as a Center of Academic Excellence (CAE) in Cyber Defense Education. Utica College is accredited by the Middle States Commission on Higher Education (MSCHE). Lewis University ranks #5 on The Best Online Bachelor in Information Assurance & Security Programs! The College of Business at Lewis University provides undergraduate and graduate programs for students seeking to enter or advance in a variety of business settings. The college represents diverse areas of business through several departments, including the Department of Information Systems. With online programs, internship and scholarship options, student organizations, and a variety of other resources, students in the college enjoy plenty of developmental opportunities. In collaboration with the School of Professional and Continuing Education, the Department of Information Systems offers an online Bachelor of Science in Information Security and Risk Management degree program designed to meet the needs of adult students seeking professional advancement. The program prepares students for a variety of professional certifications, including Certified Information Systems Security Professional (CISSP), Certified Ethical Hacker (CEH), and Certified Information Security Manager (CISM). Students prepare to pursue a variety of careers in the field, including information security manager, ethical hacker, network security analyst, and IT security specialist. As an accelerated program, the online Bachelor of Science in Information Security and Risk Management program provides students with the option of continuing their studies and earning a Master of Science in Information Security with an extra 18 months of coursework. The National Security Agency and the Department of Homeland Security designate Lewis University as a Center of Academic Excellence (CAE) in Information Assurance Education. Lewis University is accredited by the Higher Learning Commission (HLC). Saint Louis University ranks #6 on The Best Online Bachelor in Information Assurance & Security Programs! Dedicated to meeting the educational and professional needs of busy adult students, the School for Professional Studies at Saint Louis University provides undergraduate and graduate degree and non-degree programs across a diverse array of fields. With online and evening program options, professional development services, and internship and scholarship options, the school provides students with plenty of developmental opportunities. The School for Professional Studies offers an online Bachelor of Science in Computer Information Systems degree program with a specialization in Information Security and Assurance. The program serves busy adults seeking to advance careers in the field. The curriculum incorporates a blend of in-depth coursework in information systems fundamentals and information security niche study, as well as hands-on experience in a capstone course. Students emerge prepared to enter careers such as IT security project manager, network security analyst, and cyber crime investigator. Students in the online Bachelor of Science in Computer Information Systems program must complete a capstone experience. Applicants to the program must be at least 22 years old, and have a minimum of three years of relevant work experience. Saint Louis University is accredited by the Higher Learning Commission (HLC). Robert Morris University ranks #7 on The Best Online Bachelor in Information Assurance & Security Programs! The Department of Computer and Information Systems at Robert Morris University serves undergraduate and graduate students pursuing higher education in diverse information systems fields. Housed in the School of Communications and Information Systems, the department maintains a dedication to professional preparation and career readiness through offering a variety of resources, including flexible online program options, and internship and scholarship opportunities. Through the RMU Online platform, the Department of Computer and Information Systems offers an online Bachelor of Science in Cyber Forensics and Information Security degree program for students seeking to enter the information assurance field. The program develops a balanced foundation of knowledge and skills necessary to a variety of information security professions. The curriculum covers key subjects, including programming languages, cyberlaw, digital forensics, intrusion detection, and incident management. Students prepare to perform a variety of duties in efforts to prevent, detect, and eliminate information security threats. Students enhance their ability to successfully fill key information assurance roles, including information assurance manager, IT security specialist, ethical hacker, and network security analyst. The online Bachelor of Science in Cyber Forensics and Information Security degree program features accreditation by the Computing Accreditation Commission of the Accreditation Board for Engineering and Technology (ABET). Robert Morris University is accredited by the Higher Learning Commission (HLC). Wilmington University ranks #8 on The Best Online Bachelor in Information Assurance & Security Programs! The College of Technology at Wilmington University provides students with a variety of undergraduate and graduate program options for students in technological fields, including game design, information systems, and network security. Dedicated to the goal of developing qualified technology professionals, the college serves students through flexible online programs, student organizations, and internship and scholarship opportunities. The College of Technology offers an online Bachelor of Science in Computer and Network Security degree program for students seeking to enter the information assurance field. The program utilizes theoretical and practical approaches to the field, developing a balanced foundation of knowledge and skills. Students engage with key concepts in information assurance with a particular focus on computer and network security, with coursework in areas such as programming languages, cryptography and algorithms, network security strategies and implementation, and network administration. Students prepare to defend networks against cyber attacks and stop cyber criminals, in careers such as computer systems analyst, computer crime investigator, ethical hacker, and penetration tester. The National Security Agency and the Department of Homeland Security designate Wilmington University as a Center of Academic Excellence (CAE) in Information Assurance and Cybersecurity Education. Wilmington University is accredited by the Middle States Commission on Higher Education (MSCHE). Colorado Technical University ranks #9 on The Best Online Bachelor in Information Assurance & Security Programs! The College of Business and Management at Colorado Technical University provides undergraduate, graduate, and professional program options for students interested in a variety of fields. With internship and scholarship options, flexible online programs, and professional development services, the College prepares students for success in achieving and advancing future careers. The College of Business and Management offers an online Bachelor of Science in Cybersecurity degree program with a concentration in Information Assurance. The program develops a strong foundation of knowledge and skills necessary to cybersecurity and information assurance professions. The program features a certified curriculum, mapped to cybersecurity knowledge units set by the Department of Homeland Security and National Security Agency. Students engage with key aspects of the field, including network security strategies, risk management, security architecture, and network administration. The program prepares students to anticipate and combat cybersecurity threats in a variety of professional settings, including corporate, governmental, and military organizations. The National Security Agency and the Department of Homeland Security designate Colorado Technical University as a Center of Academic Excellence (CAE) in Information Assurance and Cyber Defense Education. Colorado Technical University is accredited by the Higher Learning Commission (HLC). Capella University ranks #10 on The Best Online Bachelor in Information Assurance & Security Programs! The School of Business and Technology at Capella University provides a variety of undergraduate, gradate, and professional programs of study in diverse fields. With online program options, degree and non-degree options, internships and scholarships, and professional development services, the school serves career-minded students on the path to professional success. The School of Business and Technology offers an online Bachelor of Science in Information Technology degree program with a specialization in Information Assurance and Cybersecurity. Through a blend of core coursework in information technology and specialization coursework in information assurance and cybersecurity, students develop a comprehensive foundation of knowledge and skills. The curriculum includes a blend of in-depth coursework and a hands-on research project, to develop theoretical and practical understandings of the field. Students engage with key concepts, including ethical hacking, cyber defense and counter measures, and operating systems security. Students prepare to pursue a variety of careers, including information security analyst, network administrator, and IT security project manager. Students in the online Bachelor of Science in Information Technology program must complete a capstone project. The National Security Agency and the Department of Homeland Security designate Capella University as a Center of Academic Excellence (CAE) in Information Assurance Education. Capella University is accredited by the Higher Learning Commission (HLC). Liberty University ranks among The Best Online Bachelor in Information Assurance & Security Programs! The School of Business at Liberty University provides a variety of undergraduate, graduate, and professional program options across a diverse array of professional fields in business. With flexible online programs, internship and scholarship options, and professional development services, the school provides plenty of opportunities for students to develop and succeed. As part of the evangelical Liberty University, the School of Business builds its programs around Christian principles and values. Through the Liberty University Online platform, the School of Business offers an online Bachelor of Science in Information Systems degree program with an Information Assurance cognate. The program develops a balanced foundation of knowledge and skills necessary to success in information assurance professions. Students engage with a comprehensive blend of information systems core coursework alongside specialized courses in information assurance. The curriculum covers fundamental aspects of the field, including the theory and practice of cybersecurity, digital forensics, developing and implementing information security strategies, and risk management. Students prepare to pursue a variety of careers in the field, including business risk analyst, IT auditor, Internet security analyst, and systems administrator. Students in the online Bachelor of Science in Information Systems program must complete a capstone project. Liberty University is accredited by the Southern Association of Colleges and Schools Commission on Colleges (SACSCOC). American Public University ranks among The Best Online Bachelor in Information Assurance & Security Programs! The School of Science, Technology, Engineering, and Math at American Public University provides a variety of undergraduate and graduate program options in technical and scientific fields. With plenty of online programs, as well as student organizations, scholarship options, and internship options, the school serves traditional and non-traditional students in achieving their professional goals. The School of Science, Technology, Engineering, and Math offers an online Bachelor of Science in Information Systems Security degree program for students seeking to pursue information security professions. The program includes eight options for concentration, with a general concentration, Cloud Computing, Cyber Intelligence, Cybercrime investigations, Cybersecurity, Digital Forensics, Homeland Security, or Wireless Mobile Security. With so many options for specialization, students may choose to pursue a wide array of niche professional interests. Regardless of the specialization, the program develops a strong foundation of knowledge and skills through in-depth core coursework and hands-on research. Students emerge ready to pursue a variety of careers, including cybersecurity specialist, cyber crime investigator, network security analyst, and IT security project manager. Students in the online Bachelor of Science in Information Systems Security program must complete a capstone project. Courses in this program meet the topical requirements for a variety of Department of Defense Directive categories. American Public University is accredited by the Higher Learning Commission (HLC). Western Governors University ranks among The Best Online Bachelor in Information Assurance & Security Programs! The College of Information Technology at Western Governors University provides students with undergraduate and graduate program options in a variety of areas of practice in IT. In keeping with the all-online focus of the university, the College of Information Technology offers flexible, comprehensive online programs to serve busy non-traditional students, as well as numerous useful resources. The College of Information Technology offers an online Bachelor of Science in Cybersecurity and Information Assurance degree program for students seeking to enter information assurance careers. The program utilizes a thorough curriculum to develop theoretical and practical knowledge and skills necessary to the field. Students engage with key concepts in information assurance, including cyber defense and counter measures, legal and ethical concerns, utilizing digital forensics, network security architecture and implementation, and developing security strategies. Students enhance their ability to pursue careers in diverse professional settings, including corporations, government agencies, military, and law enforcement, with job titles like cybersecurity engineer, cyber operations planner, and cyber crimes investigator. Students in the online Bachelor of Science in Cybersecurity and Information Assurance program must complete a capstone project. Western Governors University is accredited by the Northwest Commission on Colleges and Universities (NWCCU). Keiser University ranks among The Best Online Bachelor in Information Assurance & Security Programs! Founded in 1977, Keiser University enrolls over 20,000 students in undergraduate, graduate, and professional programs, on multiple campuses, as well as online. With plenty of flexible program options, professional development services, and student resources, Keiser University provides students with plenty of benefits toward future success. Through its Fort Lauderdale Online Division, Keiser University offers an online Bachelor of Science in Cyber Forensics/Information Security degree completion program for students seeking to enter information security careers. The program develops the critical thinking and technical skills necessary for success in a variety of information security professions. The program places particular emphasis on cybersecurity and cyber forensics, developing advanced knowledge in information systems, their applications, and the state of the field today. Students engage with key concepts, including network forensics, risk management and disaster preparation, security architecture, and ethics. Students emerge prepared to enter a variety of careers, including IT security project manager, information security analyst, and cyber crime investigator. For admission into the program, students must have completed an associate degree at a regionally accredited institution. Keiser University is accredited by the Southern Association of Colleges and Schools Commission on Colleges (SACSCOC). Saint Leo University ranks among The Best Online Bachelor in Information Assurance & Security Programs! The Donald R. Tapia School of Business at Saint Leo University provides students with a variety of undergraduate and graduate program options for studying diverse fields in business. In keeping with the university’s mission, the School of Business includes a liberal arts core in its programs, with coursework designed to instill Christian values and principles in students. The school offers a variety of benefits, including online program options, internship and scholarship opportunities, and the Center for Cybersecurity Education. Through the Saint Leo University Online Platform, the Donald R. Tapia School of Business offers an online Bachelor of Science in Computer Science degree program with a specialization in Information Assurance. Through a blend of core computer science coursework and niche courses in information assurance, students develop a balanced foundation of knowledge and skills. The program emphasizes theoretical and practical approaches to the field, familiarizing students with information assurance fundamentals, like computer forensics, network security, and penetration testing. Students prepare to pursue a variety of careers, such as network security analyst, security architect, and computer programmer. The National Security Agency and the Department of Homeland Security designate Saint Leo University as a Center of Academic Excellence (CAE) in Cyber Defense Education. Saint Leo University is accredited by the Southern Association of Colleges and Schools Commission on Colleges (SACSCOC). University of Maine at Augusta ranks among The Best Online Bachelor in Information Assurance & Security Programs! The College of Professional Studies makes up half of the University of Maine at Augusta, with undergraduate programs in a diverse array of field. The college serves career-focused students through flexible online and evening program options, professional development services, and other resources. The College of Professional studies offers an online Bachelor of Science in Computer Information Systems degree program with a concentration in Information Systems Security. Students interested in pursuing information assurance careers develop a strong foundation of knowledge and skills necessary to professional practice. The program includes core coursework in computer information systems, with specialized courses in information systems security. Students engage with key aspects of the field, including cybersecurity theory and practice, information security architecture implementation, and security risk management. Students emerge prepared to enter a variety of professions, including IT security project manager, network administrator, and computer forensics investigator. The University of Maine at Augusta is accredited by the New England Association of Schools and Colleges (NEASC). Limestone College ranks among The Best Online Bachelor in Information Assurance & Security Programs! The Division of Professional Studies at Limestone College provides a variety of program options for students seeking professional advancement. With online program options, professional partnerships, professional development services, scholarships, and military discounts, Limestone College serves traditional and non-traditional students alike. The Division of Professional Studies offers an online Bachelor of Business Administration in Computer Information Systems Security degree program for students seeking to enter the information assurance field. The program develops a strong foundation of knowledge and skills in information systems security. The curriculum utilizes a comprehensive blend of core coursework in business administration, alongside coursework in information systems security to develop students with a well-rounded professional understanding of the field. Students prepare to pursue a variety of careers, including information security analyst, network administrator, and IT security project manager. Students in the online Bachelor of Business Administration in Computer Information Systems Security program prepare for a variety professional certification exams including Certified Information Systems Security Professional (CISSP), Check Point Certified Security Administrator (CCSA), International Association of Computer Investigative Specialists (IACIS), Security Professional (CIW), and CompTIA’s Security. Limestone College is accredited by the Southern Association of Colleges and Schools Commission on Colleges (SACSCOC). The field of information assurance traces its origins back to before the development of computers and cyber crime. As the name suggests, the goal of information assurance involves guaranteeing the security of vital, sensitive information, and preventing it from falling into the wrong hands or being used maliciously. In the modern age of digital communication and information storage, information assurance requires strong knowledge of information systems and networks, with professionals in the field engaging in developing and implementing information security strategies and architecture. Information assurance professionals provide valuable, necessary services to corporations, government agencies, and a variety of other organizations. Though closely related, and often working together, information assurance and cybersecurity utilize different focuses in the goal of keeping information and data safe. Cybersecurity often takes on an active role in combating cyber and digital threats to information, using software, code, and other digital tools to manage incidents, and rectify or prevent damage. Information assurance, on the other hand, has a longer history, preceding the invention of computers and the need for protecting digital information. Information assurance focuses on the theory of information security as much as it does the practice, utilizing a wide variety of tools to better understand, anticipate, and neutralize threats to information security before they read the point of requiring immediate action. According to the Bureau of Labor Statistics (bls.org), information security analysts (a common position in this field) saw a median annual wage of $92,600 in 2016. The lowest 10 percent of earners made less than $53,760, and the highest 10 percent made more than $147,290. The following information reflects 2016 median annual salary information for top industries of employment. Graduates of Bachelor of Information Assurance and Security degree programs may pursue a variety of careers in the field, including. Information Systems Security Association International – With over 10,000 members worldwide, the ISSAI boasts a large professional network. The ISSAI serves information assurance professionals through maintaining a code of ethics and standards, and offering member benefits such as publications and resources, awards and funding, conferences, and training programs. EC-Council – Developed in response to the terrorist attacks of 9/11, the EC-Council develops and offers numerous training and certification programs designed to prepare individuals to combat terrorism and crime on the cyber battlefront. With over 200,000 EC-Certified professionals worldwide, the EC-Council plays a major part in the information assurance and security landscape. Some certifications offered by the EC-Council include Certified Ethical Hacker (CEH), Computer Hacking Forensics Investigator (C-HFI), and Certified Security Analyst (ECSA).